Rainbows at your fingertips! 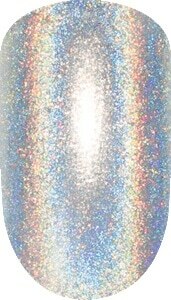 Meet Spectra: This holographic, ultra-pigmented polish creates an intense solar flare effect in direct light. Step 2: Apply a thin layer of Perfect Match Spectra Gel Polish. Cure in lamp for 30 seconds. Step 3: Apply another thin layer of polish and cure again. Repeat one more time. Step 4: Apply Gelée Gel Top Coat and cure for one minute. Wipe tacky residue from nails with lint-free wipe and cleanser. To see Spectra in action, visit the Tutorials page.